Junior Sarah Anderson competes in the Gustie Invitational. The team looks forward to its next race at the Augsburg Invitational Saturday, Sept. 15. The Gustavus Men’s and Women’s Cross Country teams headed to Crown College in St. Bonifacius, MN last Saturday for their first official meet of the 2018 season. The Crown Invitational featured two scoring teams on the women’s side and four scoring teams on the men’s side. The women dominated their opponents, finishing with 10 out of the top 11 runners in the field. 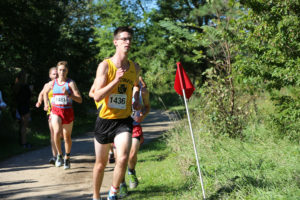 Because Northland College participated as a non-scoring team, the Gusties finished with the top five runners for a total of 15 points. Leading the way for the Gusties was Senior Lotus Schifsky who finished in a time of 20:49.86 and earned the top overall spot in the meet. The next three finishers for the Gusties were Sophomore Kourtney Kulseth who finished in 21:22.76, Junior Gabriela Passmore who finished in 21:44.94, and First-year Iliana Ramon who earned a time of 21:51.51. Junior Captain Sarah Anderson rounded out the top five for the Gusties with a time of 21:52.57. “We looked a lot stronger this week which was great to see. We tried a different approach and the ladies responded well to it. It was fun to watch them working together and pushing each other,” Head Coach Brenden Huber said of the women’s performance. The Gustie men also ran well, finishing second out of the four teams in the field. Junior Elijah Fourre competes in the Gustie Invitational. The team placed second of four teams at the Crown Invite. Senior Captain Alex Wischnack led the Gusties with a fourth place finish overall and a time of 16:56.30. First-year Jack Degonda and Sophomore Casey Olson showed that Gustavus Men’s Cross Country has a bright future with two more top ten finishes. Degonda crossed the finish line in a time of 17:13.84 and Olson finished not long after in 17:24.06. St. Thomas finished first as a team, and had five of the top six times in the meet and three times under 17 minutes. “We had some awesome efforts from our guys today. We had some tough competition which was great, because we got to see how well we measure up to others at this point. We have a few of our top guys out right now so seeing the ‘next one up’ mentality from some different runners was fantastic,” Huber said. Those missing from action for the men included Sophomore standout Andrew Stumbo, who finished fifth individually in the MIAC last year and Senior Captain Ben Madigan,who finished top-50 in the conference last season. Stumbo and Madigan both participated in the alumni meet on August 25th. The results from this event are unofficial, but the annual alumni meet is a great opportunity for the teams to brush off some rust and connect with loyal alums. “We have a good cross country family here at Gustavus. We have a lot of new faces on this team so for them so see how much pride there is in this program, it’s huge,” Huber said. In that race, five current Gusties finished under 17 minutes. Wischnack had the fastest time amongst current varsity runners with a 16:24, and was followed by Stumbo, who clocked a 16:43. Degonda and Madigan had the next fastest times with 16:47 and 16:54, respectively. Sophomore Nick Kerbeshian, who also missed the Crown Invitational, rounded out the top five with a 16:59. On the women’s side, Schifsky finished with the fastest time amongst current Gusties with a 20:18 and was followed by Kulseth, Haley Anderson, and Sarah Anderson with times of 20:25, 20:33, and 20:38, respectively. “Last year we only had a couple upperclassmen and a lot of younger kids so we took our lumps, but now it’s going to be really exciting to see a little more life injected into the program from our leaders who can see the goal we have in place,” Huber said of his team this year. The next meet for the Gusties will be Sept. 15, when they head to the Augsburg Invitational in Bloomington, MN.